A new RWB utility with a new command (CMPR) that compares 2 databases. The DIAG now checks All types of add on memory. The text describing where to set switches for multiple loads has been fixed to be easier to understand. This is going to be the last version of the UltiMulti carts. I will not produce any more after July 4, 2014. Mike White who's Quarda program and Putt Golf, etc. plus all of his knowledge in making these carts possible. Mike Garber (Riff-Raff Games) who's programs War and Crazy Climber helped make this cart unique. Richard Degler who's programs and unrivaled knowledge of this system and it's machine language made it possible to make the RBW Utility possible. The late Leroy Flamm who discovered how to make the original BASICcart and other refinements. And lastly Adam Trionfo of ballyalley.com for his diligence in cross checking and finding errors as my Beta tester. I still will reprogram older UM carts for $25.00+S&H. Is it possible to have pictures of the cart? Does it require add-on RAM or just some programs, or none at all? I have the previous model and copies of War and Crazy Climber, but otherwise I'd be all over this. Great deal from a great developer. When "Crazy Climber" and "War" were for sale, each of those carts were $50 each. Michael Garber granted permission to put those two games onto the multicart, so it's like getting his two games plus all these additional ones for free. How can you lose? The multicart contains all of the Astrocade released cartridge library and most of its prototypes plus many of other interesting bits. The carts that were released by Bally and Astrocade don't require extra RAM, but a handful of carts by third-party publishers did require it (Blue Ram BASIC, for example). Some games that were originally only released on tape have been modified to run as cartridges, and some of these "BASICarts" require extra RAM as well to work (even if the original game didn't need it). Most people don't have extra RAM... so they won't be able to take advantage of these extra games. That's okay. Think of all the other games that you WILL be able to play. As a user of the cartridge myself, I can attest that I don't really use any carts in my collection anymore except for AstroBASIC (which has the built-in tape interface). I just leave the multicart plugged into my unit and change the settings so that I can play whichever game suits my fancy at the time. If you don't have the UltiMulti already, then I highly recommend it. If you have it already, then I advise you do get the new version. I'll be sending Ken my multicart in the next few days and I look forward to the upgrade. I did the upgrade (thanks Ken for the quick turn around!) and all I can say is that this thing rocks! Finally, I didn't know about the older version. Hopefully at the end of the year when I have some real dough I can buy one of these and an Astrocade off ebay and be set. 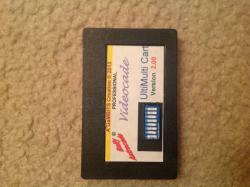 Also an Arcadia 2001 to go with that multicart I bought from 5-11under. Just wanna bump this thread real quick. Got my Astrocade multicart today. Highly recommended! All original games + homebrew games + other programs. If you have an Astrocade, you need to get this! I will order one next month.. soon enough hehe. Purchased one of these January 10th and it is everything I had hoped it would be. Amazingly well done. does the multicart come with a system diag rom, i.e. would check memory, cpu, controllers, video/colors, etc.? Where I can order one of those? I don't own a Bally Astrocade, since it wasn't available in Europe, but if I have one in the future, already owning a Multicart would be great. Just got the cart... incredible! 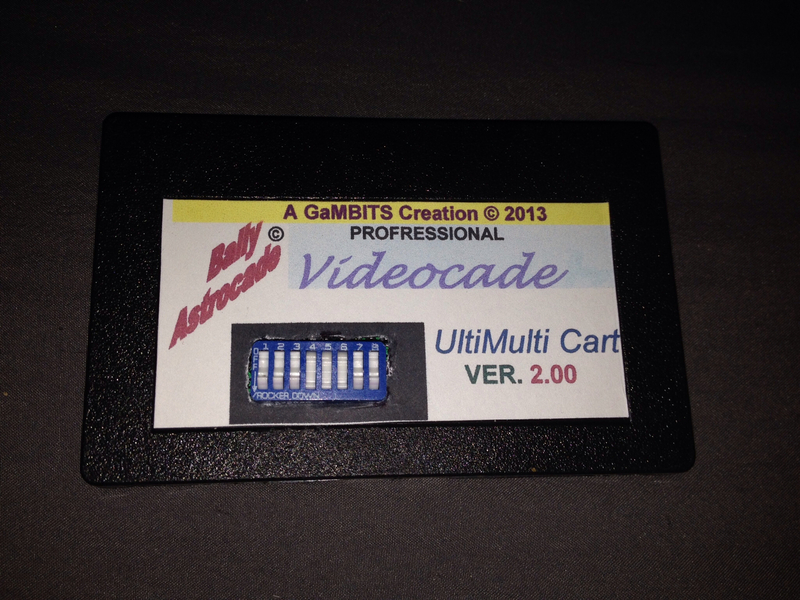 If you have a Bally Astrocade you NEED to get this multicart! This system was never on my radar back in the day, but had I seen Muncher and The Incredibke Wizard I would have saved and bought one. With your multi-cart I can now see the full extent of the Bally system! as the amount of those left dwindles. I may still have one or two for auction on eBay. Time and supply are running out!! I have sent a PM. I intend to order one right away. Picked one up at CCAG...it's great! Hey, Kenzre - still selling these? save2600 - I can't. I'm new here and the forum won't let me. I've tried a couple times to PM members directly, but I guess I gotta pass initiation or something. Try replying (and quoting) to one of his posts in this thread. He may get a notification at his external email that a post of his has been quoted. Can you receive PM's? Sent you one earlier.